I'll be honest. Today wasn't what I anticipated. 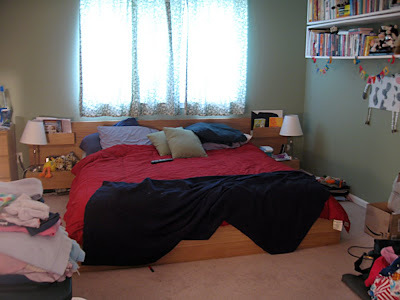 The master bedroom in our house is a catchall for anything and everything. 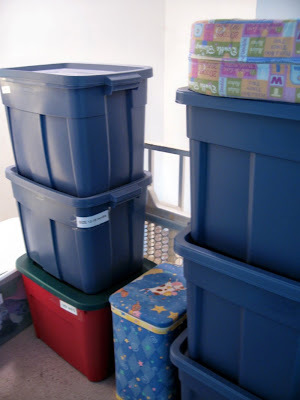 Throughout this Spring Cleaning Party, our bedroom has become the storage room for all the seasonal clothes boxes, all the items collected to Sell/Give, a steadily growing pile of laundry and lots and lots of clutter. I would have loved a clean, peaceful sanctuary at the end of the day! However, I had to settle for a fraction of that. Everything I did accomplish was a step towards my goal. 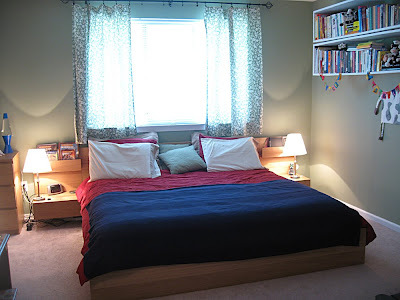 When I continue with the master bedroom, I will be much further ahead than I was before today's clean-up! 7 boxes of Winter clothing, boots and accessories plus a hamper of baby things are waiting in the hallway for my husband to put them in the attic storage! Whew! Here are my sick, cranky babies towards the end of my bedroom cleaning. They had just about enough when I snapped this shot. Time to nestle down under those fresh, clean sheets and dry those baby tears. See you tomorrow for my last day of Spring Cleaning! 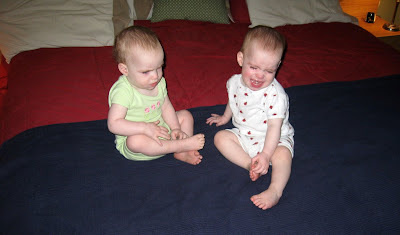 Awww - poor babies! :) Your after shot looks great - you got a lot done! Just getting those totes in storage will make a big difference! Thanks! It did create a difference in the room with just the bit of cleaning I got done! Every little step counts! I like those shelves on your wall. Where did you get them? Great job on the cleaning. Those are two cute decorations on your bed. I was inspired by bookshelves I had seen in a magazine somewhere and my husband built them for me. There are 4 shelves (2 are out of view) supported underneath with brackets. I love them! Spacify offers stylish and affordable master bedroom for your modern bedroom decoration.